A Million Dollars. A Millionaire!! Once the dream of the lofty 1%, it’s now a figure most could realistically achieve prior to retirement. Today’s article will focus on this once significant milestone, and explain the realities of achieving it for yourself. You’re 22 years old, have just started working, and received a nice $20k sign-on bonus! Congratulations! You’re now trying to decide whether you should buy that new shiny $20k car to celebrate your new employment! Alternatively, you could keep your “college junker” for a few more years, milk some life out of it, and avoid the expense. If you DON’T buy the $20k car, but rather park the $20k in an investment earning an optimistic 10%, YOU’LL BE A MILLIONAIRE by your mid-60’s. For ONLY $20K TODAY! One decision, early in life, compounded over many decades, has a profound impact on your long term financial wealth (for more on the power of compounding, which Albert Einstein called “The Most Powerful Force In The Universe”, click HERE). I’d also suggest you consider sharing this article with your kids and/or grand-kids – the best personal finance advice in the world is to START YOUNG. You can see for yourself our new employee’s $20k would, in fact, turn into $905,186 in 40 years ($10k at 10% becomes $452,592, multiply by 2 since we’re starting with $20k). Add a few more years to get to your mid-60’s, and you’ll clear the Millionaire mark! So, you’re no longer 22 years old, you argue? That’s no excuse. 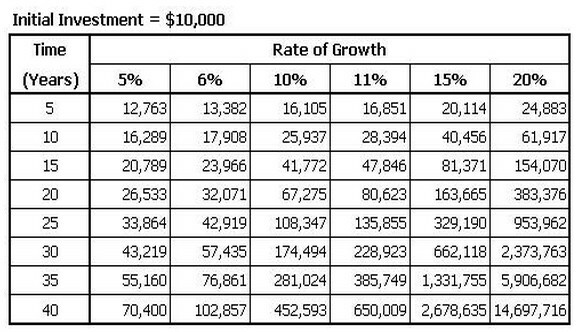 Even if you start at 45, you could turn an achievable $10k investment into an extra $67k by the time you’re 65. Do it every year, and it becomes real money. While 10% return seems to be a lofty goal, remember the average return for the S&P 500 from 1928 through 2014 is 10% (Investopedia), so it is demonstrated performance on long term investments. One trick for thinking about the above table: use it to create a “How Much Is This Really Costing Me” Factor. For example, if you’re 45 years old and you want to retire at 65, you could look at the row for 20 years. Assuming 10% return, you’ll see 67,275. Divide this by the first 10,000 and you end up with 6.73. To simplify, we’ll round it to 7. Now the fun part. For ANYTHING that you spend money on, you can easily see the true cost to your “future self” at age 65. For example, that $20 shirt you’re thinking of buying? If you choose not to buy that shirt, your future self will be $140 richer ($20 X 7). Take a minute and decide a good “Factor” for your situation, then think about it the next time you’re tempted to buy something. Another interesting way to use the table is to cut out a “0”. Instead of thinking in $10,000 investments, look at it as $1,000. For every $1,000 you don’t spend in a given year, you’ll gain $45,259 in 40 years (or, $6,727 in 20 years). To achieve $1,000 per year, you’d need to find cuts in spending of only $83/month. Cut your cable TV, and you’d see that much or more every month, every year. Do it for several years, multiply by $6,727 each year, and you can see the impact that relatively small decisions can make on your net worth over time. The reality is, you’ll likely NEED a million dollars when you retire, assuming you want to generate $40k per year of retirement income from your portfolio. Using the “4% Rule“, a portfolio of $1 Million should be able to generate a cash flow of $40,000 per year in your retirement without running out of money. Side note: many planners are saying the 4% rule is too aggressive in today’s low interest rate environment, and are encouraging folks to use a more conservative 3% assumption as they put together their Retirement Income Plan. The reality is that a million dollars “ain’t what it used to be”. Using this handy little calculator, you can see what a million dollars in years past is worth today. Using 1963 as an example (the year of my birth), a million dollars in 1963 is, on an inflation adjusted basis, equal to $7.8 Million today! You don’t need $7.8 million, but you should target $1 million as an achievable goal. It sounds like a lot of money, but in reality you need a lot of money to support your lifestyle once the pay-checks stop flowing. The point is this: recognize the impact your small purchases make when compounded over time. To quote the Huffington Post article, that $5 cup of Starbuck’s coffee is costing your “future self” $225. Focus your first efforts on your repeating expenses, like cable TV, land line phones, magazine subscriptions, etc. Track your spending for a month or two, you’ll be surprised what you can find. Go on a hunt, and free up whatever you can to invest. Remember your reason, and be encouraged by recognizing that whatever you save is worth far more to your future self. Do it long enough, aggressively enough, intentionally enough, and you will become a millionaire. Or an alternative and faster yet riskier route to becoming a millionaire is by starting-up a tech company.